It seems that the backpack is now becoming the favorite means of carrying one’s laptop and other electronic devices around, be it to work or while traveling. Once you think about it, it makes perfect sense. Besides carrying your laptop, you still have enough room to carry any documents that you may need, power supply and cables, water bottle, and dependent upon your state of physical fitness, running shoes and gear. STM Bags, based in Australia, have been a supplier of stylish and well designed laptop bags, backpacks, tablet cases and even phone cases since 1998. I have utilized their products as part of my everyday life through the years, particularly when it comes to transporting my electronic gear around, be it by vehicle, subway or airplane. The Drifter Backpack is composed of 320D/640D Water resistant poly with the interior lining made of 200g Polyester with brushed Nylex. Designed to carry a laptop between 13 to 16 inches in a separate well padded fleece-lined interior compartment, the backpack also has a fleece-lined tablet pocket that can hold a tablet up to 10 inches. There is another pocket, unlined, that a paper tablet or electronic tablet fits neatly into. I have had no problems at all with carrying my 13” MacBook Pro, my Dell laptop that I have to use for work and even my 3rd generation iPad with no stress on my back. If I’m not carrying the Dell, I can put my Canon camera and additional gear, to include a collapsable tripod in the interior of the backpack without causing any problems. The bottom of the inside of the backpack is well padded so it will help to protect your electronics if you have a tendency to drop you bag (something that I do not recommend) rather then setting them down. The shoulder straps are also padded but the padded rear of the backpack really helps in dispersing any weight comfortably across your back. I like the fact that the backpack does ride up higher on the back rather then lower like a rucksack. The Drifter also has an integrated luggage strap that let you slide the backpack over the handle of your carry on luggage bag, making life a bit easier as you make your way through an airport. 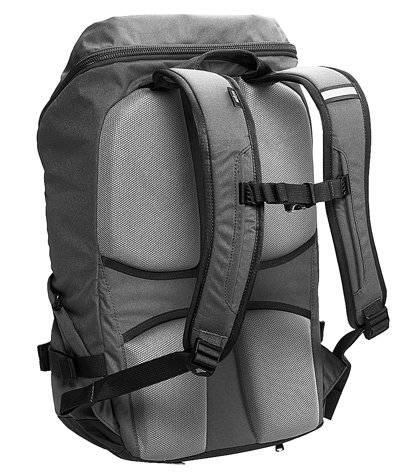 Another nice feature is the side straps on the bottom sides of the backpack that let you adjust the size of the backpack. Just carrying your electronic gear and some other light items, you can bring the straps in tighter. If you’re carrying additional items, like your running gear or clothes, you can loosen the straps. Nicely thought out design feature for a backpack. 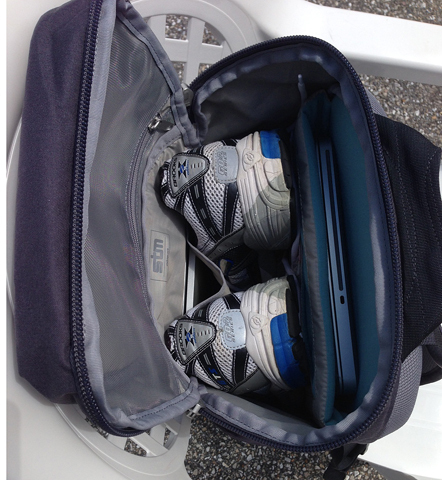 As you can see in the picture below, I’m able to fit my MacBook Pro, my iPad and my running shoes (size 12 so they take up a bit of room) with my running shorts and t-shirt below the shoes. The really nice thing about the Drifter backpack is the flexibility that it offers the user. Pockets? Yes, the Drifter has pockets! On the top flap of the backpack there is a zippered pocket on the outside of the flap as well as a zippered see-through mesh pocket on the interior side of the flap. Just below the top flap, there is a zippered pocket, large enough to hold your power supply units for your laptop. Below that there is another zippered pocket with slots on the inside to hold pens, USB flash drives and even a clip to hold your keys in place. There is pocket on one side that can hold a water bottle and a zippered pocket on the other side that can hold additional small items such as your phone, charging cable or your wallet if you don’t carry it on your person. The backpack also comes with its own rain cover that is secreted in a zippered compartment on the bottom of the backpack. For the past few weeks, I have been using the Drifter almost daily to run it through the wringer, as it were. If I was going to the library, laptop and Drifter went along for the ride. If I decided to run out to do some photography, my laptop/iPad and camera gear went into the backpack. To test the comfort level of the backpack, a few times I put it on when I would go out for an early, and I do mean early, morning run. During the runs, I would put several books into the Drifter, adjust the straps and secure the across the chest strap and take off, doing some sprints. The thick padding on the back of the Drifter kept the books in the backpack from impacting on my back. I figured that was the best way to simulate running for the bus or subway as a lot of folks are prone to do. The Drifter stayed put during those sprints, no slippage or any issues. Something new that has been added to the mix is the inclusion of a “Reward Tag” that has a unique ID number that if you were to misplace the backpack, the finder could go to a listed website, enter the ID tag number and if you had so chosen and set it up, find if you had listed a “reward” for the return of the backpack. After using this backpack and putting it through the wringer, it has impressed me with the design and style, but more importantly with its flexibility and comfortable use. 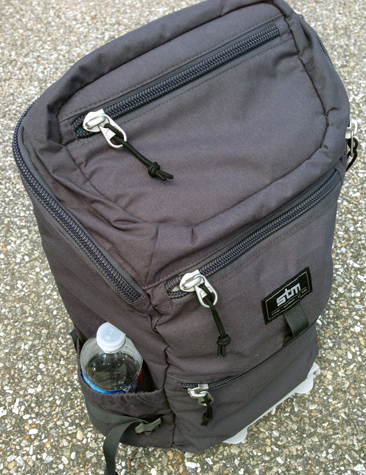 If you are considering switching to a backpack, I would highly recommend that you check out STM’s Drifter Backpack. Please be aware that STM offers their products through online vendors and through some brick and mortar stores. The STM Drifter Backpack is available in three colors: Red, Olive and Graphite. 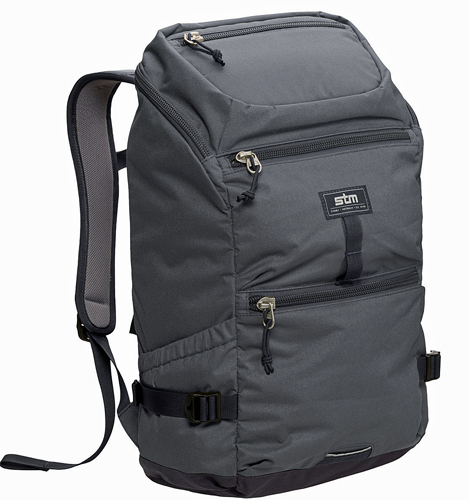 All in all, I give the STM Drifter Medium Laptop Backpack a My Mac rating of 9 out of a possible 10.